The Bloomberg Econoday Consensus was for a month-over-month rise of 0.1%, instead prices declined by -0.2%. Case-Shiller is reporting what is becoming striking weakness in home prices, at -0.2 percent in July for the adjusted 20-city index which, after a downward revision to June, is the third straight 2 tenths decline. Twelve of 20 cities show contraction in the month with the deepest for a third straight month in a row coming from Chicago at minus 1.2 percent. Year-on-year readings are all still positive led by San Francisco at plus 10.4 percent with Washington DC at the bottom at 1.7 percent. Year-on-year, the 20-city index, whether adjusted or unadjusted, is at plus 5.0 percent vs 4.9 percent in July. The unadjusted month-to-month index, reflecting summer strength in home sales, was up 0.6 percent in August for however the weakest reading since the winter weather of February. This report is very closely watched and offsets last week's gain for FHFA prices which are trending slightly higher than Case-Shiller. Home sales have been mixed this year with existing homes showing strength through most of the year but weakness in the latest report and vice versa for new homes which had been weak but have since popped higher. Lack of home-price appreciation is a negative for household wealth and spending and may be another symptom of general price weakness. 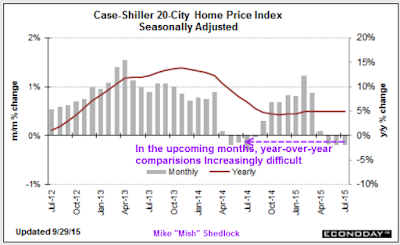 Year-over-year comparisons have held stable at 5% in spite of month-over-month declining prices because of easy comparisons. Year-over-year comparisons will be increasingly difficult in the upcoming months.